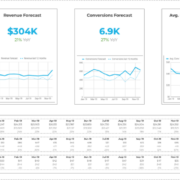 This is the first in my series on data driven marketing examples and case studies including step-by-step guides on how to apply simple data analysis techniques to real life marketing challenges. 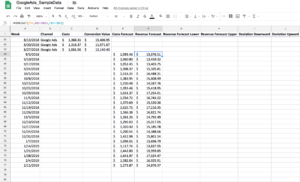 In this guide I’ll describe how to use simple linear regression and formulas to forecast marketing revenue in Google Sheets. Above chart is based on (anonymized) data out of my work at Google. It’s the marketing spend from an account from one of our smaller clients. You could pull the same kind of data from your own Google Ads account (or similar data from Facebook or any other marketing channel). I’ll go through everything step-by-step and explain it all, but I recommend having open below sheet with the example data and play along to really understand it. If we rise our investments by 20% compared to the last 6 months, what will be the revenue from Google Ads on a weekly basis for the next 6 months? It won’t be enough to give a total estimate for the next 6 months, but we have to give a forecast for each individual week. We have to forecast at least 24 week into the future. 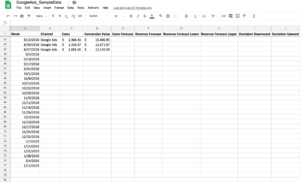 In addition to the task you have a Google Sheet containing dates, costs and revenue data from the last year. As mentioned in my other post one of the first steps is almost always to prepare and format the data in the right way. Possible to-do’s here could be formatting the fields correctly (e.g. 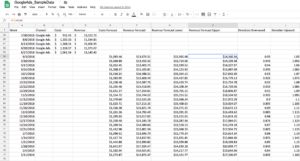 costs and revenue as dollar values) or deleting not needed columns. Luckily this all has been done already in the sample data sheet. However there is still some stuff to-do. First, we should check if costs and revenues are related. Obviously this should be the case as investing more in Ads should lead to more traffic, which should lead to more conversions – but you never know. And you might use this method on a data set, where it isn’t as obvious, which why is testing for correlation is so important (however don’t confuse correlation with causation). You should get a correlation coefficient of 0.81, which indicates (as expected) a fairly strong positive relationship between ad investments and overall revenue. It will add 7 days to above date. Now drag it down into the other cells until you have all the 24 future weeks. That’s it for preparation. Let’s start forecasting! We will have to do two things here. Plug-in the future investments and forecast the resulting revenues. What the FORECAST formula does is it predicts through linear regression a future value by using existing values. In our case the predicted value is revenue (y-value) for a given cost (x-value). The existing revenue values (y-values) are in cells D2:D53 and existing cost values (y-values ) in cells C2:C53. You can use this function to predict revenue, traffic, and a lot of other things. I added $ dollar signs in above formula in order create an absolute references. So when you drag the formula down it won’t change the referenced existing values. Forecasting is never 100% accurate. You will always have a deviation upwards or downwards. Taking this into account is quite important and as such you should also show it in your analysis. We’ll take the assumption that in our first predicted week we will have a deviation of 5% in either direction, meaning the actual revenue can be either only 95% of the predicted revenue (lower bound) or 105% of the predicted revenue (upper bound). Therefore plug in 0.95 in cell I54 and 1.05 in cell J54 . and dragging both down as usual. You’re done! Or at least almost. 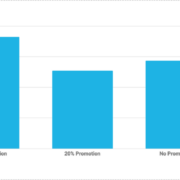 Technically you are done already – you predicted revenues for your marketing channel for the next 6 months. However nobody want to read a boring table and drawing insights from that table is very difficult to impossible. So the last step to take is to build a chart on top of your analysis. This will level the start of the forecasts to the actual revenue. That’s it! Obviously you can change the colors of the lines (which I did in above screenshot and the example sheet) to make it look prettier and more organized. Certainly above is a very simple solution for forecasting revenue as there are a lot more advanced techniques such as more sophisticated machine learning methods. We are also not counting in any other influencing factors as for example seasonality, competition etc. when forecasting based on the last 6 month. How will the the next days outside temperature affect my sales? How will the number of blog posts affect my website traffic? Will conversions go up or down during winter months?